Time is running out for Greece as the Euro-area backed bailout extension expires at 6pm ET and $1.8bn of payments to IMF are due. A technical default will trigger further repayment and Greece will lose $18bn in funding overnight, 60% of which comes from a Greek bank rescue fund. Greece is on the precipice of financial meltdown. If capital controls were not imposed this weekend, Greek banks would’ve exhausted reserves by early next week or sooner. Market reaction: Most of the contagion seems to be limited to Europe and there doesn’t seem to be an expectation of a major impact on US markets beyond the short-term sentiment driven sell-offs. In fact, US markets already saw a quick rebound this morning. Even within Europe, the markets response was tepid compared to previous “Grisis” moments. Volumes stay compressed meaning investors aren’t panicking. European peripheral 10Y bonds widened only about 35-40 bps to Germany- a moderate move compared to the dramatic widening in 2011 and 2012. The market response is subdued largely because the fundamentals in Europe are looking up on QE, cheap oil and lower euro. The ECB has established credibility for the markets and there is weakening of direct transmission mechanisms of contagion to rest of Europe through the financial sector. The ECB’s policy actions in the coming weeks will depend on the extent of spillover to European sovereign debt and the financial sector. If the ECB takes aggressive action, we could see a Euro sell-off. Most market strategists are assigning a 30-50% probability to Greek’s exit from the Euro-zone. If Grexit does happen, the impact on the monetary union is unclear since there is no formal documentation for member removal from the monetary union. For Greece, however, the exit scenario will probably look like Argentina in 2000-01 with tightening of capital controls and a dual currency environment. Any resolution would be positive for the markets than the current situation of ongoing uncertainty which is knocking confidence down. Our portfolios are performing as expected with respect to our target benchmarks as we have limited direct exposure to the European markets. We’re seeing an uptick in financial stress indicators and are closely monitoring the situation. The political situation is unlikely to cause us to change our portfolios drastically unless we see a corresponding deterioration in economic fundamentals. I posted the final entry of my smart beta series for ETF.com. Check it out here. 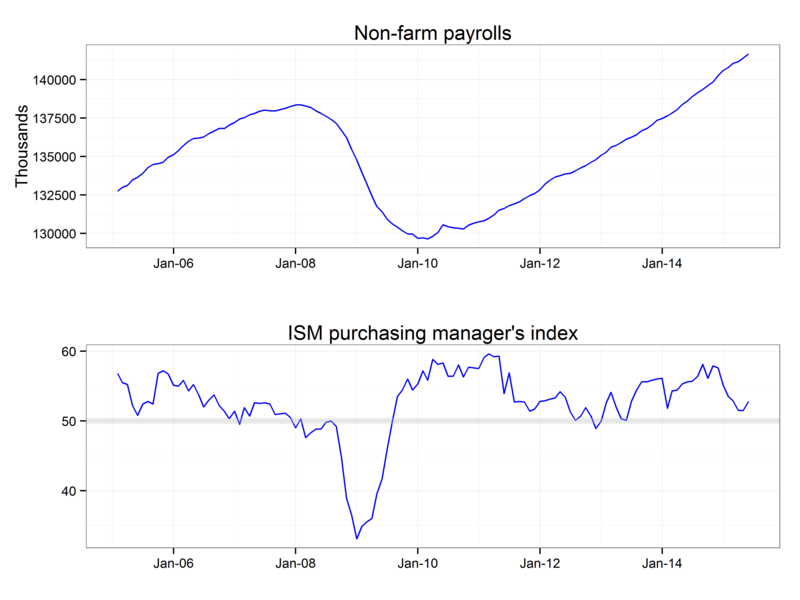 • Today’s payroll number adds a bit of evidence for the idea that the first quarter’s economic weakness was temporary. The gain of 280,000 jobs was the best reading of the year, tough still below the average for the second half of 2014. The secondary numbers from the report were also either steady or slightly stronger. • In this quarter the data, as interpreted by the Atlanta Fed, point to another below average growth, but stronger than the first quarter. There is some reason to think that the actual state of the economy was stronger than these readings of GDP lead us to believe. GDP tallies up all the expenditures in the economy over the year and calls that “the economy” another version counts up all income, to people and businesses, and calls that (which is known as Gross Domestic Income or GDI) ‘the economy”. In principal they should be equal but it may be the case that income is easier to measure than expenditure. For the first quarter of 2015 GDI showed a dip, but a much less dramatic one than GDP. See this post for more on GDI. • The chart below emphasizes the steady growth in payrolls as well as a continued positive reading for the US. Steady as she goes. • My expectation is still for the Fed to be raising rates this year, though modest inflation expectations may give them pause. I will have a detailed preview of the FOMC before the June 17th meeting. 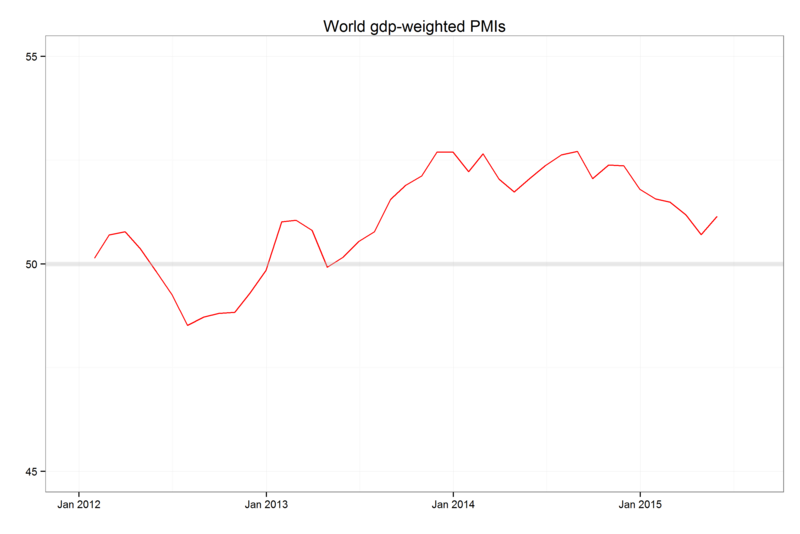 • Internationally, the chart below weighs the PMIs of 20 countries by their GDP. This measure showed its first uptick since last August. Perhaps lower oil prices is helping the rest of the world. Most of the major economies had stronger readings last month, though a China was essentially flat and its growth transition is still a concern. • Overall, I am a getting less concerned about the economy stalling into recession in 2015, though I would love to see some stronger growth in the US and overseas.